Welcome, and thanks for visiting my website.My husband Artie and I are getting ready for the 2019 season. I love doing shows and meeting so many new people. It energizes me to paint more! Thanks to everyone who has visited me last year or in the past and/or purchased paintings. I have lots of new paintings for you to see this year. My work is generated from my life's experiences and all the interesting objects around me in the world. I never run out of ideas because I love to turn mudane objects into painting subjects. I paint things that make me feel good, so I hope it makes you feel good, too. One of my newest painting is "Superheroes." 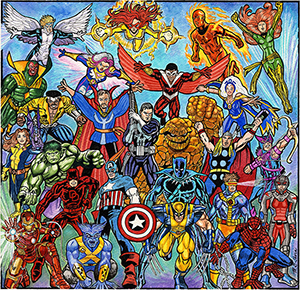 These are based on the Marvel Comic Book heroes and heroines. Click on the painting link below to see a large version and other new paintings in my “New And Recent Work” Gallery. 2019 Art Show schedule is tentative and subject to additions and revisions. Click on this link to see my entire season of “Exhibits and Shows”.